On Monday, November 26, Congressman and former KCD parent John Yarmuth made a surprise visit to KCD to present three KCD students and computer science teacher Brian Wagner with an award. 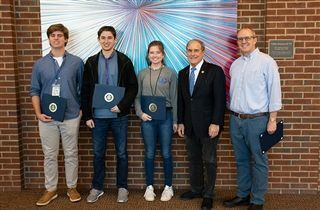 A smartphone app developed by Sam Adkins, Kate Ensor, and Mitchel Green was the winner of the Congressional App Challenge, a district-level competition for middle and high school students, encouraging them to learn to code and inspiring them to pursue careers in computer science. Students in Mr. Wagner’s Advanced Computer Science class developed and submitted their apps for consideration after learning about the challenge. Sam, Katie, and Mitchel’s app, “Apollo,” is an Oregon Trail-type educational game about the space program. Congratulations to Mr. Wagner and these students—this award is a great accomplishment for our Computer Science Department!